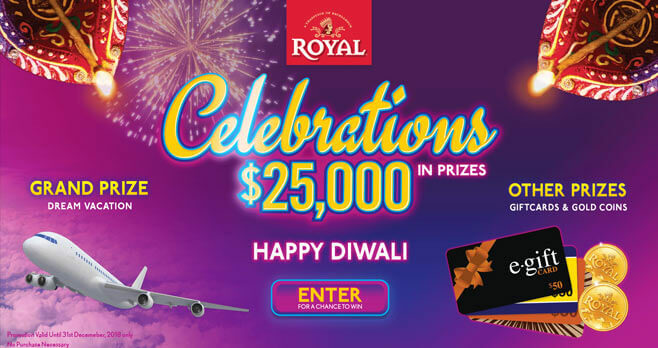 Get a coupon code inside specially marked Royal brand Basmati Rice participating products and enter it online at www.royalcelebrationsgame.com for a chance to win the Royal Celebrations Sweepstakes and Instant Win Game. You could win a $5,000 dream vacation, gift cards, or gold coins. The Royal Celebrations Sweepstakes and Instant Win Game is open to legal residents of the fifty (50) United States and the District of Columbia who are at least 18 years of age at the time of entry. The Sweepstakes begins at 12:00:01 a.m. PT on October 1, 2018 and ends at 11:59:59 p.m. PT on December 31, 2018. Limit one (1) Sweepstakes entries and one (1) Instant Win game play per person using only one (1) email address per day. The grand prize consists of Dream Vacation worth $5,000. Visit www.royalcelebrationsgame.com to enter and see Official Rules for details.